Let’s talk about how awesome it is to eat vegetables that taste like cash money. I mean, not literally, just in the way of, like, you know, when it tastes like, really good, like something that might cost you a lot of cash money, or has the same positive association of money, not that money is everything but, like… gah. You know what I mean. Have you started school again? Or your kids? O your kids’ kids? Or you’re the teacher? Or you work from home and you’re looking out the window to borrow some back-to-school vibes from the kiddos in backpacks walking to the bus? Back-to-school is upon us all. See also: OH. MY. GOSH. It sounds so basic to say that I can’t believe that it’s already that time of year – probably because it IS so basic. It’s what I say every season, every year. But with the upheaval and constant grief of this last year, time just feels especially weird. Like it’s been both too slow and too fast all at once. But as usual, time ticks on, and that is, I guess, is how you find yourself staring down the completed ravaged back-to-school section at Target wondering why the pencils are already out because didn’t summer just start? Here we go again. I’m making it sound like this is a bad thing, but I actually adore everything about the fall season. As a former teacher, I think I will always have a little bit of that super zealous back-to-school spirit running through my veins. At top of my list of things I love about fall is really, really good food. Like, comforting, cozy, wrapped in a sweater kind of good food. Think ancho turkey chili and cornbread after the first week of school. Carnitas and magic green sauce on game day. Detox lentil soup and no-knead bread for your first official on-time dinner in months. Green curry. Green curry with some weirdo stuff in it (tofu? golden raisins? sweet potatoes?) that is going to make you feel like you won both the nutritional and yumo-food olympics. I added a handful of golden raisins (go on and get wild) and cilantro (WHEN IN DOUBT OBVI) and did not regret either of those very out-of-the-box decisions. May I also recommend finishing it up salt bae style with a hit of 1) fish sauce, which will make you question everything you ever knew, and 2) brown sugar? Tell me about it, girl. I thought about making my own green curry paste, but friends, in my googling, I read that many Thai cooks think it’s better to just buy the commercial jarred curry paste than to make your own if you’re going to be making substitutions. Hello. Hi. Good news! Savin’ me some work. And hopefully makes it taste more authentic, according to the internet. I can do that. I can buy up a jar of green curry paste and cook up some curry magic with it. Words about store bought green curry paste: I used Thai Kitchen green curry paste and found it to be might tasty in this curry. To be fair, I wouldn’t describe the paste itself as write-home level good, but it works for making a green curry real nice and quick with a single, list-less trip to a single, basic grocery store. This is an automatic win. However. Upon further research, I found that many people recommend Mae Ploy brand green curry paste. Any users who can confirm? Leave a comment, you neighborhood curry paste experts. So for the making of the first 5+ batches of green curry in my life, I used Thai Kitchen green curry paste. But I have, in the last two days, ordered my first little container of Mae Ploy green curry paste – thank you Amazon! – and I will soon get to the bottom of this. So here we have it: the first, back-to-school, easy and comfy-cozy recipe of fall. 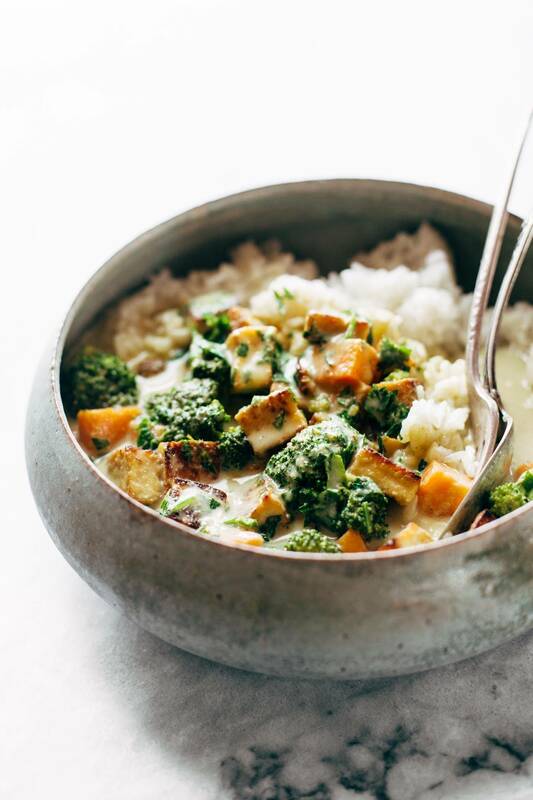 If steamy rice + creamy green curry + a deep, huggable bowl = fall, I swear I am so ready. Update 1: As promised, I tried Mae Ploy brand green curry paste and really enjoyed it. However, it is MUCH, much spicier than the one I used in this recipe (Thai Kitchen). If you use Mae Ploy, I would suggest using more like 1-2 tablespoons to start and adding up based on what level of heat you’re comfortable with. Update 2: I’ve gotten a few comments from people who are wanting to use less coconut milk. That’s totally fine! You could use just one can of coconut milk, for example, and thin the rest out with water or broth of some sort. It is just the difference between a thick and creamy curry (how I like it) or more of a brothy, soupy curry. To be honest, green curry that I’ve had at restaurants is usually soupy, but in making this recipe, I kinda wanted it to stay rich and creamy like a Panang or Massaman curry. 5-Ingredient Green Curry! packed with tons of veggies, an easy green curry sauce, and finished with golden raisins and cilantro. Tofu: Press the tofu with paper towels to remove water. Cut tofu into cubes. In a large soup pot, heat the olive oil over medium high heat. Add the tofu, sprinkle with salt, and pan fry for 10-15 minutes, until golden brown. Remove and set aside. Veggies: Add sweet potatoes, coconut milk, and curry paste to the soup pot. Simmer for 5-10 minutes until potatoes are fork-tender. Add broccoli and tofu. Simmer for 3-5 minutes until broccoli is bright green. Finishing it off: I like to add a handful of golden raisins and cilantro (I know, I know, lots of levels of weird going on here) and I pinky promise that a quick swish of fish sauce and a sprinkle of brown sugar will take this over the top. Serve over steamy white rice! But hopefully that’s obvious. Swap tofu for another protein if you like chicken, shrimp, etc. If you need this to be 100% vegan, then you will need to check your curry paste label! Many use shrimp paste or other fish products in the paste itself. Sometimes I make this with two cans of coconut milk, maybe thinned out with some water, and sometimes with three when I want it thick and creamy. It just depends on how much extra “sauce” I want with it and what texture you want the sauce to be. IF USING MAE PLOY OR MAESRI BRAND CURRY PASTE, USE LESS! I love spicy food, but when we tried it with Mae Ploy I just about burned my mouth off. Start with 1 tablespoon and work up from there. However, Thai Kitchen brand is much milder and 4 tablespoons is the right amount for that one. Nutrition information is for the green curry only. It does not include rice. This recipe is part of our collection of best healthy vegetarian recipes. Check it out! nice recipe, nicely different too, at least for me, great fall-friendly dish, thank you! Heavenly recipe – perfect when the weather takes a turn too! One question though… Where is that beautiful bowl from? This was so incredibly simple and easy to make, but so yummy! I made it on Sunday and had dinner and was able to make a lunch serving for every day this week. I added 2 tablespoons of brown sugar and a swirl of fish sauce to the pot while everything was simmering, as well as cilantro to garnish. Perfect! Glad you enjoyed it, Emily! I love five-ingredient recipes, and I LOVE LOVE LOVE green curry! 😀 This is wonderful, but I definitely will make it vegan if I try it! Great recipe base! I think it’ll take me a couple more tries to get the coconut milk variety and amount just right, but my first attempt was very tasty. I used trader joe’s organic coconut milk (about 2.5 cans – a mix of full fat and light) and I realized it’s not as thick as other types I’ve used. I also took your advice of ordering Mae Ploy on Amazon (since I’m always ordering a million things on Prime anyway…) — about 1.5 tablespoons was the perfect amount of spice/flavor for me. It was great with tofu and I’m looking forward to trying it with shrimp at some point too. May be my heritage of South Asian, i love anything with curry on it lol.. Thanks a bunch for 5 ingredient green curry recipe. i like photos of food. veggies are looking good. empress us more by your foods. All I can say is… Yum! Thank you for this. Now, go have a lake day. OMG! They look so yummy! I’ve tried making my own curry paste and it really is a lot of work. It’s a huge time saver being able to just scoop it out of a jar! Its look marabous, all pics are sound yummy. In today dinner, i will be making this. Thanks to sharing yours recipe. I will be wait your next yummy recipe. I love your web site and your recipes – but I didn’t like the green curry sauce. It was bland and not as great to us as a red chili coconut sauce. We made this tonight and I almost didn’t serve it to my family…added some extra red curry paste and it was edible then. Think it needs something – maybe the fish sauce should be added as one of the essentials? The key might be finding the perfect paste that you like, especially since that flavors everything! Hey, Thanks for sharing this wonderful recipe. Hi Lindsay! I really REALLY want to make this but I just can’t handle spicy food. Do you think this will still taste good if I swap the green curry for a more milder curry? Like Masaman or Penang curry? Thank you! Maybe it won’t look as pretty as yours but I just love how easy this is to put together. My favorite curry! Yummy and healthy at the same time! Do you think adding kale at the end would alter the flavor profile too much? I have a bunch left over in the fridge that I’d like to put to use! LOVED this yummy dinner!! Even my three year-old gobbled up those sweet potatoes. Especially love that it’s something I can memorize and do a million times again. Thank you, Lindsay! Absolutely delicious! I used broccolini, zucchini, and red peppers. Used craisins instead of golden raisins. Leftovers were super tasty too. Just made this tonight! Such a yummy flavor, but my tofu wouldn’t brown and just ended up sticking to the pan, so the browned layer was lost! How do you solve this? Yum! How do you keep the tofu from sticking to the pan? More oil? I use 3 tbsp of Maesri green curry paste and LOVE it, but I like it SPICY. I have never seen the Mae Ploy brand before so I’ll have to look around and give that a try! I make this every few weeks because I love it so much! So simple but so delicious. I didn’t really follow the recipe (I only used one can of coconut milk, 1 sweet potato, 2 tablespoons of curry, etc.) and it turned out amazing. Brown sugar and fish sauce definitely helped!! Thank you!! Ok, this looks so delicious!! 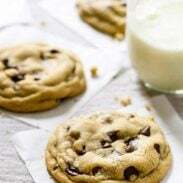 I want to try this recipe soon, thanks for sharing!